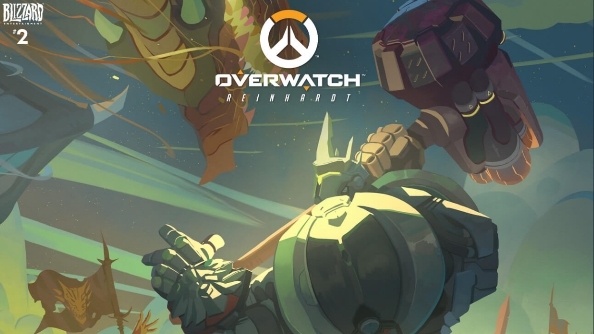 The second issue of Blizzard’s Overwatch comic has been published online, allowing you another glimpse into the hero shooter’s colourful universe. In the spotlight this time is Reinhardt, who handily lives up to the title of ‘dragonslayer’. The comics are great for backstory, but to find out what these guys do in the game you need our Overwatch character guide. The ten page story sees Reinhardt walk into a village haunted by dragons, which naturally our hero plays a major part in exterminating. Cue the use of various abilities and the forging of some badass armour that protects from bitey and fiery attacks. All in all there will be six Overwatch digital comics, plus two more animated shorts. If you’ve not seen the short film “Recall”, starring monkey man Winston, then you’re certainly missing out.